Bamboo garden stakes come in a variety of length and width sizes and can be used for a multitude of things, not only in the garden but also in the home. Made from cylindrical lengths of bamboos, the plants are typically harvested at between 4 and 6 years old. At this age the harvest achieves maximum tensile strength for the pole. For vegetable gardening they can be really useful. During the spring many gardeners are planting young runner beans and peas plants which both need staking for the plants to grow up. Staking prevents the plants from trailing on the ground and you will need to ensure this is high enough, particularly for the beans. You can also use them to stake young plants that you have just planted out to give them a bit of stability while they are getting established in their new location. The support will prevent the wind from blowing them over before their roots have spread enough to stabilise the plant so it is strong enough to stand up for itself. A stake with a bit more width will also be strong enough to support a young tree or shrub while it gets established. There is no point in spending your money on new plants and trees just to have them blow over in the night and die from having their roots exposed. Bamboos are just as good and strong for staking as a more traditional wooden stake, and likely to be much cheaper too. Bamboo garden stakes and poles are considered to be more environmentally friendly than chopping down young trees just to stake out another young tree. To use a young tree to stake another one doesn't make sense when you consider trees take much longer to grow than bamboos do and when considering the environmental concerns evident in todays world. Bamboo garden stakes are usually small to medium in diameter and will be pre-cut to suit a variety of purposes such as those required by nurserymen and gardeners. 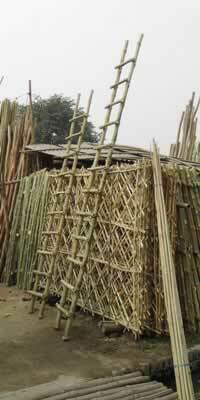 Bamboos used for crafts are also harvested and cut to lengths to suit different types of craft uses. Support poles come in different colours, for example; grey, green, natural, and cream, sometimes bleached. Natural poles should be harvested at the right time to ensure optimum strength of the stake. The poles can be round or half split. Half split means they have been cut down through the middle with the result of a semi-circular cross section to the pole. Poles used for structures needing more strength will have a wider diameter such as those that may be used for structures such as needed for a wedding arbour. Many suppliers will have a policy to supply natural and untreated bamboo garden stakes so make sure the are not toxic. Untreated poles are what you need for use in gardens and around plants of any kind. Any toxic preservatives or treatments may be harmful to the plants so ensure that the poles you buy have not been treated in this way and they are stated as being suitable for gardening and plants. The only drawback of this is that they may therefore be susceptible to fungal or insect attack if they remain untreated. If you do decide to treat the poles against insect and fungal damage, be sure that the treatment is suitable for your purposes.